Kawah Ijen is the crater of an active volcano on the island of Java, Indonesia. The place attracts local and worldwide tourists who embark on a journey up the mountain to see the famous turquoise lake and the phenomenon called electric blue flames. The beauty is indeed impressive, but it is important to know that there is an ugly side to this place, so common in the region. 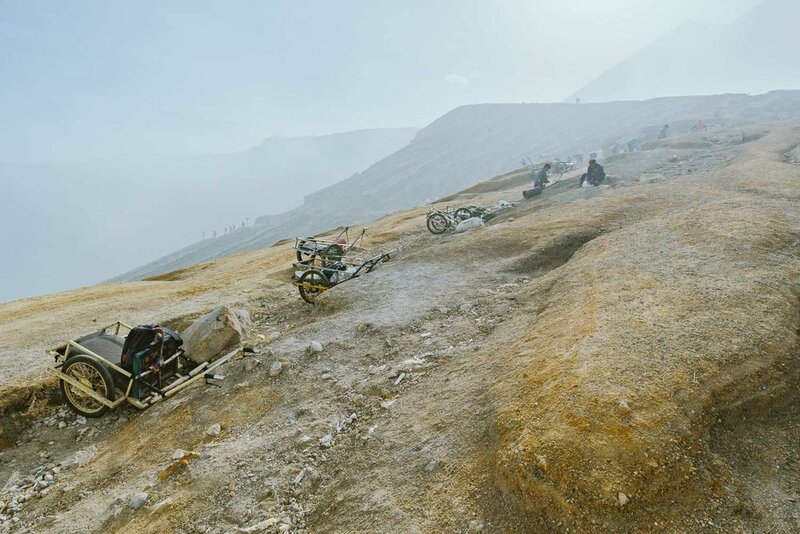 The truth is that, on the way to the top of the volcano, you will come across the most precarious working conditions in tourist areas in Indonesia. And the reason? 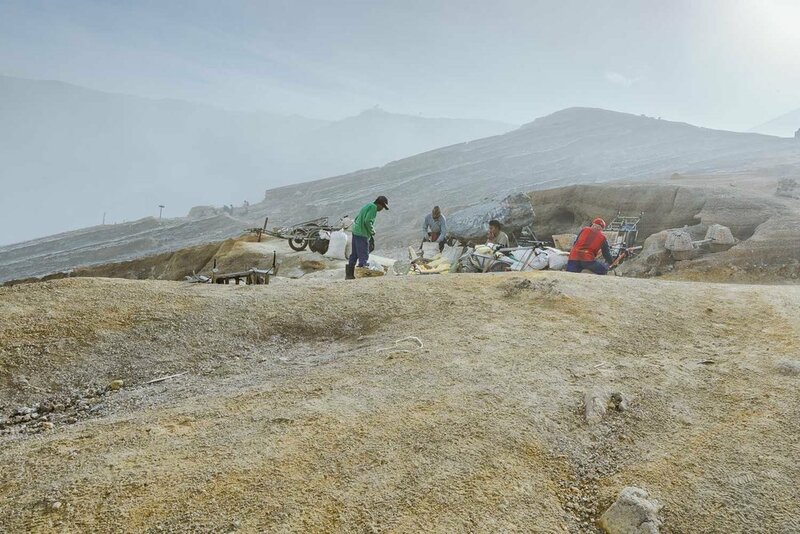 Kawah Ijen is the only place in the world where sulfur extraction is still done manually. Mining began there in the late 1960s, and the extraction of the yellowish substance (that leaves the air with the smell of rotten eggs) is done manually, through the work of people who climb the mountain twice a day. 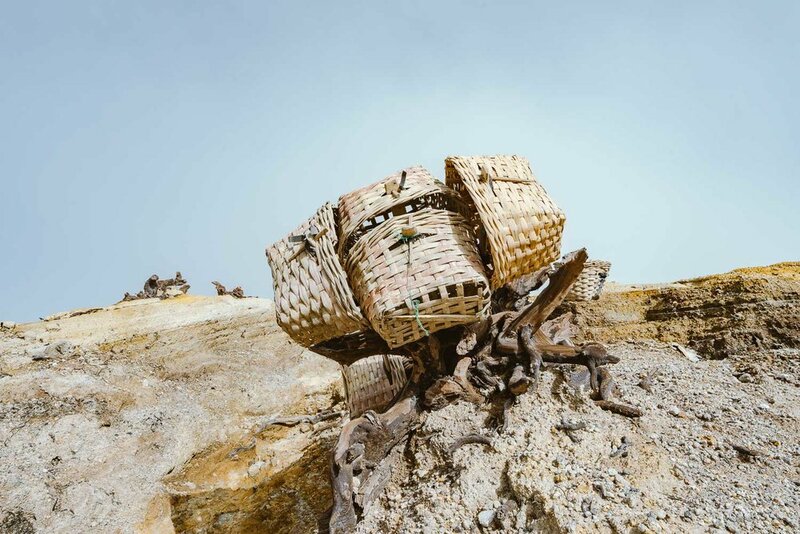 The miners carry up to 100 kilograms of sulfur, either on their back using oversized baskets or using the help of carts. The work leaves them with calluses on their backs, leg and spinal problems; and all this to earn around US$ 10 daily. For them the payment is high, considering that they would earn less than half of that working in some of the plantations in the region. But the burden of the activity is that the whole area is covered in sulfur dust, which burns the eyes and throat. With these unhealthy working conditions, you can see many of them coughing as they breathe in the volcanic gas. While tourists receive masks to protect themselves from sulfur gas, workers who stay there for several hours do not have the proper gear and clothing. Many wear only a shirt around their faces to protect themselves from gas and slippers on their feet (some say they have access to masks but decide not to use them because they believe it makes breathing difficult and slows down the work). To earn more money, workers often offer to carry tourists in their carts. And, to my surprise, I saw some people accepting it. The value? 100,000 IDR, which would be divided among the number of miners carrying the visitors (as they need at least two, each one would receive around US$ 4). I had even read about it in some places, but I confess I was not prepared for what I saw. Although the workers are smiling and always wishing everyone selamat pagi (good morning, in Indonesian), I confess that it bothers me how tourism continues unabated in the region. When visiting the volcano, would we be corroborating the precarious situation of the miners? Or does the money from tourists in any way contribute to the income of the local community? And if you're wondering where all this sulfur goes, you should know that it's used in the production of cosmetics, refined sugar, detergents, fertilizers, explosives, etc.